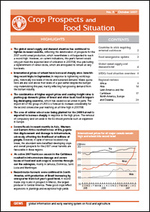 5 October 2007, Rome - International wheat prices have increased sharply since June, hitting record highs in September in response to tightening world supplies, historically low levels of stocks and sustained demand, according to FAO’s latest Crop Prospects and Food Situation report, issued today. " 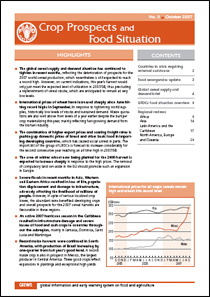 The global cereal supply and demand situation has continued to tighten in recent months, reflecting the deterioration of prospects for the 2007 world cereal production, which nevertheless is still expected to reach a record high. However, on current indications, this year’s harvest would only just meet the expected level of utilization in 2007/08, thus precluding a replenishment of cereal stocks, which are anticipated to remain at very low levels. International prices of wheat have increased sharply since June hitting record highs in September, in response to tightening world supplies, historically low levels of stocks and sustained demand. Maize quotations are also well above their levels of a year earlier despite the bumper crop materializing this year, mainly reflecting fast-growing demand from the biofuel industry. The combination of higher export prices and soaring freight rates is pushing up domestic prices of bread and other basic food in importing developing countries, which has caused social unrest in parts. The import bill of the group of LIFDCs is forecast to increase considerably for the second consecutive year reaching an all time high in 2007/08. The area of winter wheat now being planted for the 2008 harvest is expected to increase sharply in response to the high prices. The removal of compulsory land set-aside in the EU should promote such an expansion in Europe. Severe floods in recent months in Asia, Western and Eastern Africa resulted in loss of life, population displacement and damage to infrastructure, adversely affecting the livelihood of millions of people. However, in spite of serious localized crop losses, the abundant rains benefited developing crops and overall prospects for the 2007 cereal harvests are favourable in these regions. An active 2007 hurricane season in the Caribbean resulted in infrastructure damage and severe losses of food and cash crops in countries throughout the subregion, mainly in Jamaica, Dominica, Saint Lucia and Martinique. Record maize harvests were confirmed in South America, with production of Brazil increasing by one-quarter from last year’s good level. A record maize crop is also in prospect in Mexico, the largest producer in Central America. These good crops reflect expansions in plantings and exceptional high yields.